Essiac tea aggressive dose is recommended if you have, or suspect that you have, cancer or another illness or disease. Essiac tea aggressive dose is 9 oz. of tea per day. Click here to read testimonials from people who take essiac tea aggressive dose. If you are currently undergoing chemotherapy and/or radiation treatment, the suggested aggressive dose is 9-18 oz. per day. The higher recommendation is due to the fact that some of the active enzymes in the essiac may be destroyed by chemotherapy and radiation treatments. (If you DON'T suffer from any health problems right now, you need the maintenance dose recommendations. They are listed here at the bottom of that page. 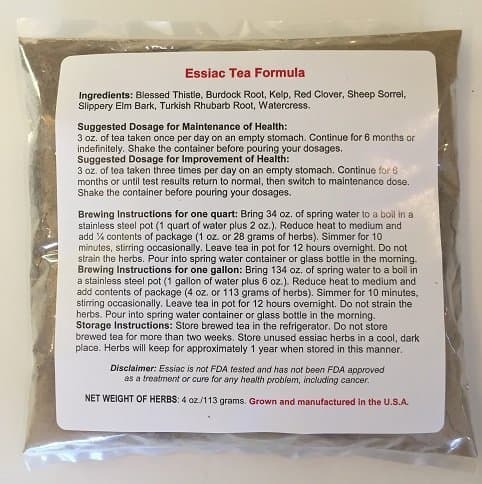 We have chosen to use an inexpensive packaging method and to keep our overhead costs low at bulk-essiac-tea.com so that we can pass the savings along to you. This means that it will cost less than $1 per day to drink essiac tea aggressive dose, or $106.97 for a 3 lb. 4 oz. order of herbs. Pound-for-pound, this even beats the wholesale prices of other companies! All orders come with essiac tea aggressive dose instructions and brewing instructions (in ounces). If you'd prefer instructions in grams, please request it when you order. 'If you'd like the most economical choice, order a 'bulk' package. You pay less because you'll need to weigh the essiac yourself when you brew them for tea every 2 weeks: You'll need to weigh out 4 oz. (equivalent to 113 grams) of the mixture of herbs, which will prepare one gallon of tea. One gallon of essiac tea will last two weeks for one person taking the aggressive dose tea. Your other choice is the 4 oz. packets rather than the bulk bag. If you'd like the most convenient and easy option, order the 'sealed 4-oz. essiac packets.' Each 4 oz. packet contains just the right amount of herbs to use when brewing a gallon of essiac tea. The most popular order size for those taking essiac tea aggressive dose is the 3 lb. 4 oz. order, and we recommend that size if you've never tried essiac before. Ordering at least 3 lbs. at once is the most economical option when considering shipping costs. A 3 lb. 4 oz. order whether in the bulk form or the sealed packets form will last 6 months for one person. Click here to order the 3 lb. 4 oz. organic essiac in bulk form. Click here to order the 3 lb. 4 oz. organic essiac in sealed packets. Convenient 4 oz. polybags make 1 gallon of tea each. While the 3 lb. 4 oz. order is the most popular size, we also offer essiac in other sizes, designed to suit specific needs. Click on the link to learn how to sign up for our Newsletter and Special Essiac Tea Offers --you'll be glad you did! We're limiting the number of recipients who will receive these special offers, so be sure to visit now if you'd like to take advantage of this opportunity.